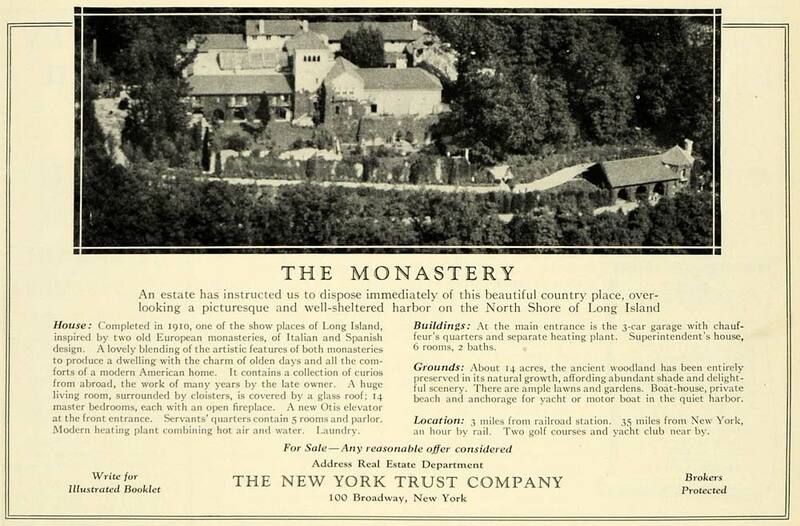 A 1925 advertisement for 'The Monastery', the Mrs. Farquhar Ferguson estate designed by Allen W. Jackson c. 1908 in Huntington Bay. Click HERE and HERE for more on 'The Monastery'. Another great find, Zach. This 1925 advertisement says to write The New York Trust Company for an illustrated booklet -- which means somewhere out there a booklet or two most likely still exists. The old real estate brochures are so useful. Pity that the realtors were not required to send a copy of each to the Library of Congress---it would so shorten my own research right now. It looks so much more than 14 acres. That makes it all the more sad since it was so manageable. To TDED's remark on the brochures sadly fewer properties (of this caliber) are even having physically printed ones today. Elaborate on-line presentations which likely will be erased in a few years have taken over. Its back on the market sans any brochure although an elaborate collection of on-line images. Apologies to Zach for the hijack. The Monastery was seemingly a lovely homes that was more manageable than many of its peers. Somewhere adjancent to The Monastery was the home of Julius "Nicky" Arnstein and Fanny Brice. Supposedly still extant, Anyone? Kellsboro..I have to say, with the exception of the all the recessed lighting, Spa,Screening room and some of the guest rooms, I'm very impressed with Chiltern. Seems very well built with natural materials, and much of the stone and wood work look done by an artisan and not a machine. 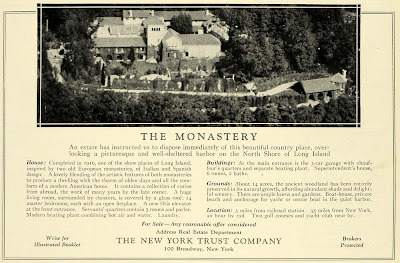 As for "The Monastery", I alway thought this was one of Long Islands tragic losses along with "Spring hill", "Peacock Point","Burrwood", "Harbor Hill", "Pembroke", "Meudon" (original, not latter), and "Knollwood"....there are too many to mention, just on the North Shore alone. Kellsboro, I just looked at the 75-photos in the on-line listing for Chiltern that you linked to ... Holy Crap! I wonder how often the owners have to ask a guest to pack up & leave -- cause they'd have to find me first. Chiltern was, as I recall from the marketing materials, in their spin was once a 1920s estate lost and a new estate created on the site. So while it is technically identified as created in the late 1980's/early 1990's it used a tremendous amount of top grade architectural salvaged materials. The 1990's seller lost his fortune in a financial reversal with a fund he ran. The property languished for a time with a mega asking tag and considered too heavy on the religious detailing. It is actually rather toned down with the artifacts compared to 1995. Overall it accomplishes (and that is a rarity) in capturing much of what visual details of an estate from a century ago.